OH MY we’re gettin’ real close to when the summer really pops off!!! Things are rockin’ up here in Winslow as the Bull Crew ain’t holding nothing back. 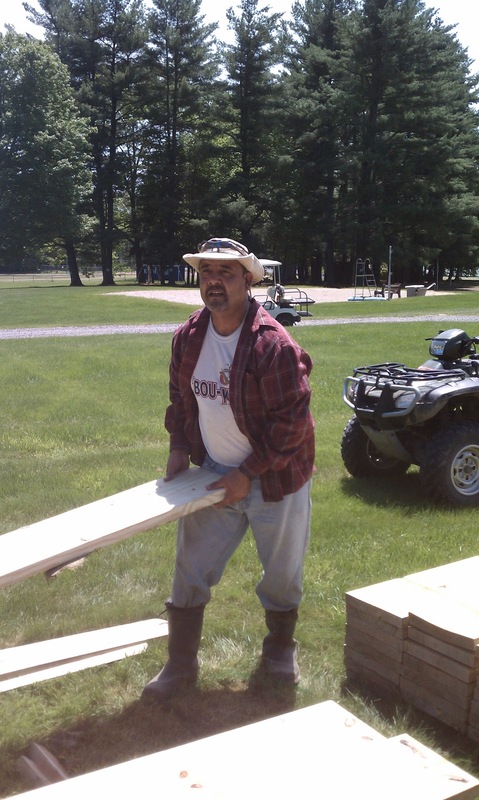 With the new archery range, new lodge porch, infirmary and lodge renovations, and getting the peninsula looking like mid-season form, the crew is getting their groove on. Quick side note: The latest Bull Crew jump off is “Party Rock Anthem” by LMFAO, its a ridiculous song, Rafa really likes it and currently is learning how to do the party rock shuffle. The latest additions to the crew are JP and Damien Deminey, both are real eager to hit the ground working. This past Memorial Day Weekend we had loads of people come and visit. Martha, Jerry, Brian Hershey, Jeff Weinstein, Adam Fischer, and Levin-Ep all made the trek up to the ‘Bou. It was a jam packed weekend full of family, friends, home run derby, basketball, and good food. This upcoming weekend Lori will be heading to Skidmore for her college reunion, There she will be meeting up with Joanna and Alex Kantor, two Caribou Staff Alums. HAVE FUN LORI!!!!! We can’t believe we are 22 days away from camp starting. UNREAL. keep in touch! !